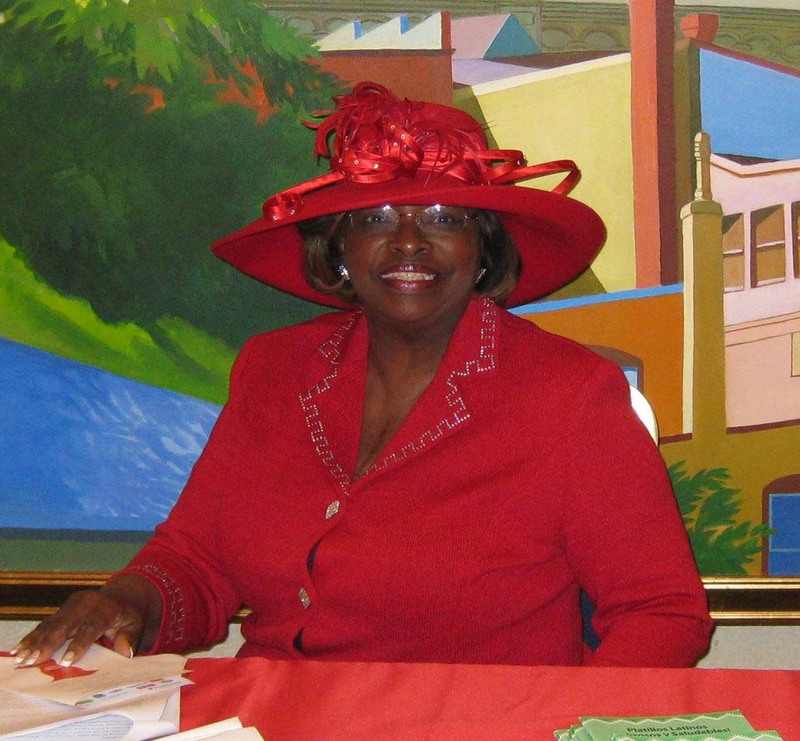 Trenton, NJ- Newark City Councilwoman Mildred C. Crump served as the honorary chair of the Women's Heart Foundation's annual Red Dress Luncheon that took place Feb 1 at the Trenton Marriott Hotel. The Women's Heart Foundation, an organization dedicated to insitutionalizing wellness and prevention programs, joined with partners -The New Jersey Federation of Women's Clubs GFWC, The Mayors' Wellness Campaign, and the League of Women Voters to hold its fourth annual Red Dress affair with an awards ceremony to honor leading Women's Heart Advocates, provide screening and education, and a chance for women to come together to support one another in the fight against heart disease. The program was funded in part by a grant from The Heart Truth and other sponsors, and included an elegant Red Dress Trunk Show sponsored by Lord and Taylor, commentated by store manager Christian Redding Cruz. Author, journalist and radio and television personality Jennifer Lewis-Hall served as celebrity host. Ms. Crump is a heart attack survivor. The theme of the program was "Be The Change". "I was fooled by heart attack symptoms", said Ms. Crump. "It was like bad indigestion -- an uncomfortable feeling. I thought it was something I ate. My co-workers insisted I seek care," she said. Although not recommended, she drove herself to the hospital. Emergency room staff immediately noted her serious condition and sent her for further testing. "I told them I was too busy to remain in the hospital… that I had a lot of appointments and meetings coming up. But as it turned out, they kept me and I had to have heart bypass surgery." Ms. Crump said she is very grateful for the excellent care she received and is glad to be alive. Keynote presentation was delivered by New Jersey Commissioner of Health Heather Howard, J.D., who read a proclamation from Governor Jon S. Corzine commemorating the Women's Heart Foundation event and in observance of National Heart Month. Assemblywoman Bonnie Watson Coleman also spoke, encouraging women to work together and support one another to incorporate heart healthy changes. Other honored guests who attended the affair included NJ State Assemblywomen Cleo Tucker and Grace L. Spencer; Attorney Sharon L. Weiner, Esq, President of the Women's Political Caucus, and colleagues from Scarenci and Hollenbeck, LLC; Carolyn Lewis Spruill, RN, Director of Health and Human Services, City of Trenton; Carolyn Stimike, RN and Margaret Latrella, RN of the Women's Heart Center at St. Joseph's Regional Medical Center; Anna Doremus, RN; and Pat Reid, RN, and Winsome Bright, RN of the Capital Health System. Richelle Heston with The Women's Heart Advocate Volunteer of the Year, given in support of the WHF annual Mothers Day 5K Run for Mom event and other program assistance. Marinez and Jasmine each took podium time to describe how the Teen Esteem program has helped her make heart-healthy changes. They cited weight loss, feeling better about themselves and being close to their gym teacher, Ms. Kelley, as top benefits of this WHF program. Walking the Red Carpet to advocate for women's heart health were Assemblywoman Watson Coleman, Councilwoman Crump, Jennifer Lewis-Hall, New Jersey Federation of Women's Club GFWC president Anne H. Redlus, Roslyn Council of NJ Department of Health and Senior Services, Gerri McKay and Bonnie Arkus, among other Women's Heart advocates. The second half of the program was dedicated to testimonials whereby women gave one another support and shared their stories. Angela Kubisky led the way, telling of her experience with chest pain as a wake-up call to lose weight. She has since lost 40 pounds, she said, and has learned that she needs to take better care of herself. Roslyn Council told of the recent death of her 60 year-old sister from heart disease. Karen Baylor, Cardiac Diagnostic Tech at Princeton Medical Center said she sees few women coming in for testing and this must change. In closing, Ms. Arkus introduced the new WHF Red Dress bookmark to the audience, with 10 Health Tips for Heart Smart Women, and on the reverse, Heart Attack Signs and Symptoms, and how a woman must respond. The red dress is the national symbol to raise awareness of heart disease in women. Each attendee received two bookmarks - one for herself and one for her "heart sister". Bonnie urged women to BE THE CHANGE in their local communities as President Obama is advising all of us to do. Advocate for wellness and prevention programs and help start up prevention programs locally, like the WHF Teen Esteem Health and Fitness Program for 10th grade girls and like the Montgomery Township Council and the township high school collaboration to open the doors of the school to provide free or low-cost swimming and access to fitness opportunities for residents. Ms. Arkus referenced Mayor Cecilia Birge of Montgomery Township who said that senior citizens lobbied the Montgomery Township Council to have the local high school pool made available to them when not in use by the students. The seniors approached the town council with the argument that they support the schools financially with their tax dollars, yet they receive no benefit. They complained the local "Y" is too crowded and too expensive. The township responded by formalizing an agreement with the school to cover the cost for additional hours for a lifeguard and for the chlorine. Seniors are now allowed free access to the Olympic-size pool. Other citizens are allowed access for a nominal fee. "These are just two examples of health and wellness opportunities that can help change communities and fight the obesity epidemic", she said. "And they cost nothing - just the agreement to share existing resources." Ms. Arkus predicted as the recession deepens and more people are unempolyed, learning how to share resources will become even more vital. Ms. Arkus also took the opportuity to implore women smokers to stop smoking. Studies show smoking takes an average of 19 years from a woman's life and is even more or a health threat to a woman's heart than a man's. Finally, she asked for support of the Women's Heart Foundation wellness and prevention programs with a donation of just $1 a month. Serving on the Red Dress Luncheon committee 2009 were Mayor Cecilia Birge of Montgomery Township, Christian Redding Cruz of Lord and Taylor, Judith Doyle of the Mayors' Wellness Campaign, Janice Kovach of the NJ Department of Community Affairs, Anne H. Redlus of the NJ Federation of Women's Clubs of GFWC, Anne Ruach Nicolas of the NJ League of Women Voters-Trenton Diane Maki-Sethi of the NJ Federation of Women's Clubs of GFWC, Janet Oberndorfer, Priscilla Baer, Eunice Salton, Chris Spear of Silk Purse Magazine, Sharon L. Weiner, Esq., and honorable chairwoman Mildred C. Crump. Red Dress Luncheon exhibit table sponsors were Alligary Vintage Purses, Roma Bank and Capital Health System, who also provided blood pressure screenings. Product sponsors included Jennifer Lewis-Hall with donation of her book "Life Changes" to each attendee, POM Wonderful, Elizabeth Arden cosmetics, Lord and Taylor, Earthbound Produce, Chiquita Banana, Fresh Express Produce, Time/Life Warner's Health magazine, AWHONN's Health for Women magazine, Mrs. Dash, Sports' Authority and French Twists by Barry's Bakery. Music was provided by singer-song writer Dawn-Marie Lang with 'Songs from a Woman's Heart', and by LaFauci Entertainment. Women's Heart Foundation, a 501c3 and the only non-governmental organization that implements heart disease prevention projects, is dedicated to prevention of heart disease and improving women's survival and quality of life. WHF advocates for women and supports early intervention and excellence of care through The Gender Care Initiative®. For more information, go to www.WomensHeart.org or send an email request to info@womensheart.org WHF founder, Bonnie Arkus is credited with starting the women’s heart global movement in 1986 after her mother's death from open-heart surgery. The Women's Heart Foundation is based in Trenton, New Jersey. The mission of the New Jersey State Federation of Women's Clubs of GFWC, is to provide opportunities for education, leadership training and community service through participation in local clubs, enabling members to make a difference in the lives of others one project at a time. During the 2008-2010 administration, the President’s Emphasis Area in the Home Life Social Services Department is to encourage the more than 9,000 club members to learn about Heart Disease and its symptoms that are particular to women and to hold programs in their clubs and communities focusing on exercise and weight control that would lead to a healthier heart.